Logistics Support Analysis (LSA), sometimes also called Maintenance Engineering Analysis (MEA), is a methodology that supports the logistics needs of the aircraft throughout its life cycle. Through the structured approach of LSA, all aspects of Integrated Logistics Support (ILS) are planned in advance. As a result, the efficiency of maintenance increases and cost of logistic support is significantly reduced. A successful LSA allows the identification of the aircraft’s maintenance and logistic support requirements throughout its life cycle, early enough to influence the system design.LSA forms the embedded basis of ILS, ensuring open exchange of information between aircraft design and aircraft logistics. 1. Design for aircraft support: design with focus on minimization of operation, maintenance, training, support tasks and life-cycle-cost while optimizing operational readiness/ airworthiness/ dispatch reliability. LSA Commander is the latest addition to the family of ALD Software: RAM Commander, ESRA FRACAS and D-LCC. 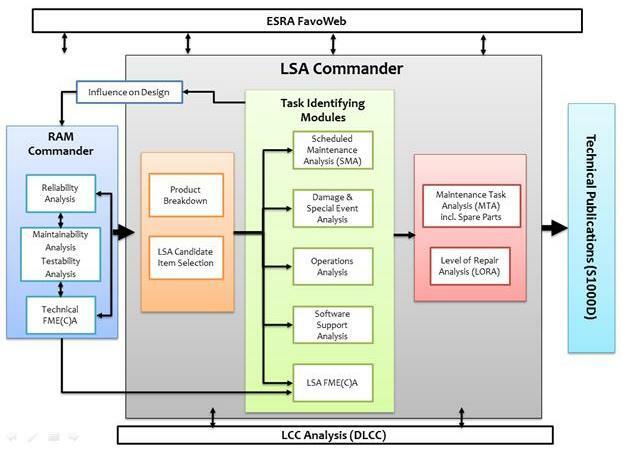 LSA Commander unites all ILS and LSA modules and features previously supported by various ALD Software tools: RAM Commander, ESRA FRACAS and D-LCC.The main goal of LSA Commander is to implement and adapt the entire scope of the LSA’s latest ASD S3000L standard. By implementing ASD S3000L, LSA Commander allows closure of the gap between the design of the aircraft and the ILS activities, which play a crucial role in the development of an efficient maintenance program – one of the most important elements of the aircraft’s after sale support. Aircraft dispatch reliability; cost-effectiveness and safety are the outcomes of a well-developed LSA concept.LSA Commander makes it easier to manage and perform the complex tasks in the scope of LSA, such as logistic FME(C)A, MTA, LORA etc., and provides the information needed to influence the design at an early stage, thus reducing maintenance and operational costs and minimizing the total ownership cost.LSA Commander is a comprehensive platform that facilitates all LSA activities performed throughout the aircraft’s life cycle, in accordance with ASD S3000L standard. It also supports the tasks described in older standards: GEIA-0007, Def Stan 00-60, and MIL-STD-1388-1A. LSA Commander is a platform intended for both actual analysis work, as well as management of the tasks and activities, data flow between them and monitoring of the overall status, to ensure effective and efficient maintenance.LSA Commander Database collects all the data produced throughout the different analyses and tasks and provides input for production of technical publications. 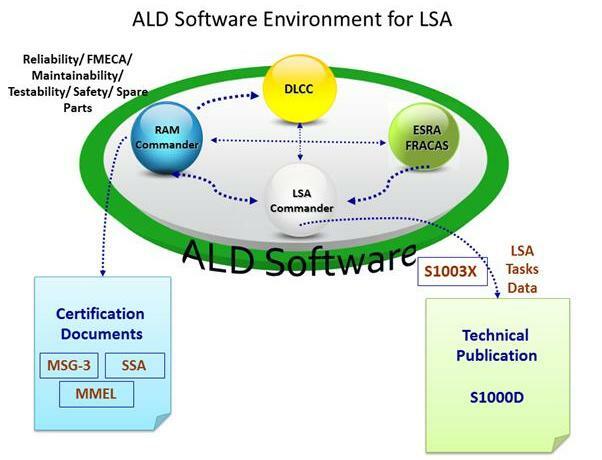 LSA Commander Software Environment uses the outputs from and provides inputs for ALD’s other software tools RAM Commander, ESRA FRACAS and D-LCC), together creating a package that covers all aspects of RAMS and LSA of the aircraft throughout its life cycle.